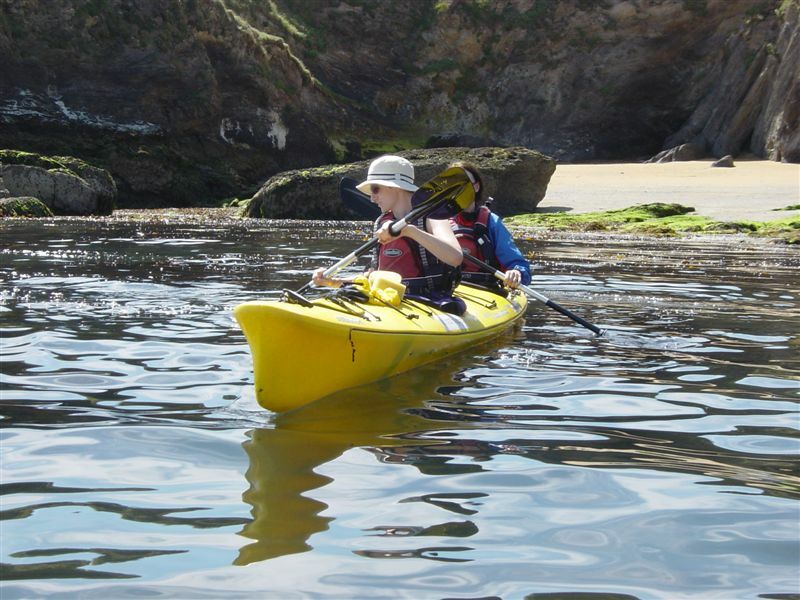 I had booked a beginners' sea kayaking expedition with H2O Sea Kayaking in Kinsale to coincide with the start of a family holiday in Cork and persuaded my wife, Deborah, and her sister, Imelda, to come along too. We met our instructor, Noelle, at Sandy Cove and, after getting us all kitted out, she gave Deborah and Imelda a brief paddling lesson before we set off. 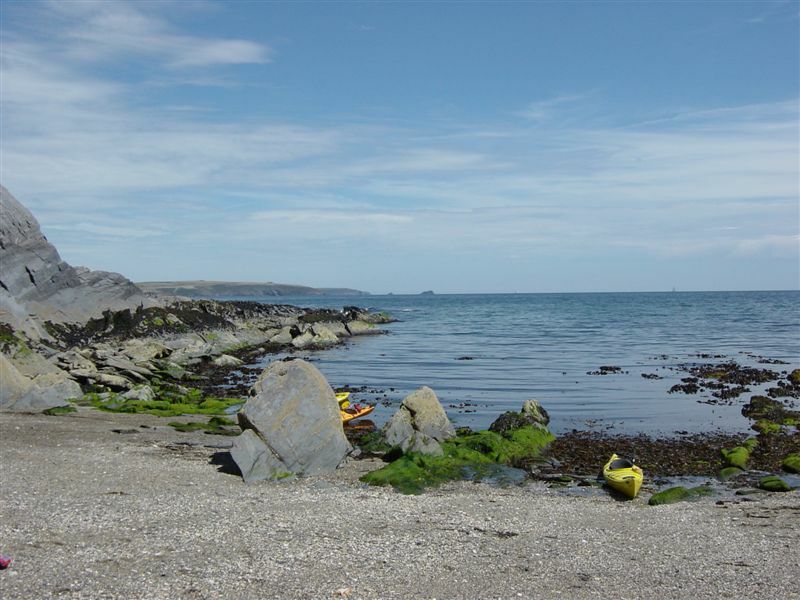 Once out of the shelter of Sandy Cove Island the calm water gave way to a smooth oily looking swell of about 0.5 metres, the clear water giving good visibility to the seabed below through waving fronds of kelp. The moving water gave us all the chance to get a feel for the handling of the boats. Deborah and Imelda seemed to enjoy working together in the double while I found my extremely wide boat rather unwieldy and bracing my knees on either side of the gaping cockpit felt like doing the splits. Despite my reservations, the boats did at least make good progress and we soon rounded Hake Head where we spotted cormorants perched with wings outstretched drying in the sunshine. 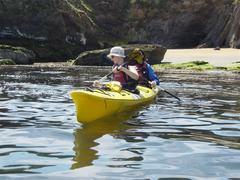 We paddled towards a secluded beach for lunch and the appeal of sea kayaking began to sink in. This isolated spot could barely have been reached by any other means as it was nestled beneath cliffs with no access by land and even small craft would have difficulty getting in close. After a leisurely lunch we headed across Dooneen Bay for Blackhead, the swell was larger now but the sea surface retained its oily smooth quality. Even in these benign conditions I was aware of the vulnerability of our boats on the open sea as we left the shoreline about a kilometre off to starboard. Noelle showed us the entrance to a dramatic sea arch at Blackhead and I paddled in to explore and take some photos, unfortunately, the tide was too low to paddle through. We rounded Blackhead and found ourselves in a slightly heavier swell of up to 0.75 metres and we paddled for the castle visible above us on the cliffs at the narrowest part of the peninsula. 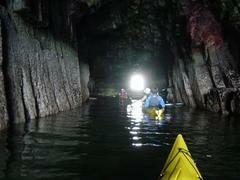 Under the castle are three sea arches which go right through the headland and we explored each in turn hoping to find a way through. Paddling into the middle, and largest, arch was the highlight of the trip. Our arrival roused the colony of nestling terns perched on every nook and cranny around the entrance creating an awful squawking din. Also notable was a strong smell of fish, presumably the birds� leftovers. Once inside the arch the water was shallow and clean and we saw shoals of sprats swimming beneath us and small starfish clearly visible on the seabed. At the far end the sun shone in as if through a Gothic cathedral window. We clambered out of the boats at a stony beach halfway through to explore the exit. We carried one boat over the rooks and Noelle went to investigate the far entrance but felt that the breaking surf might make it tricky for Deborah and Imelda and so we returned the way we had come. 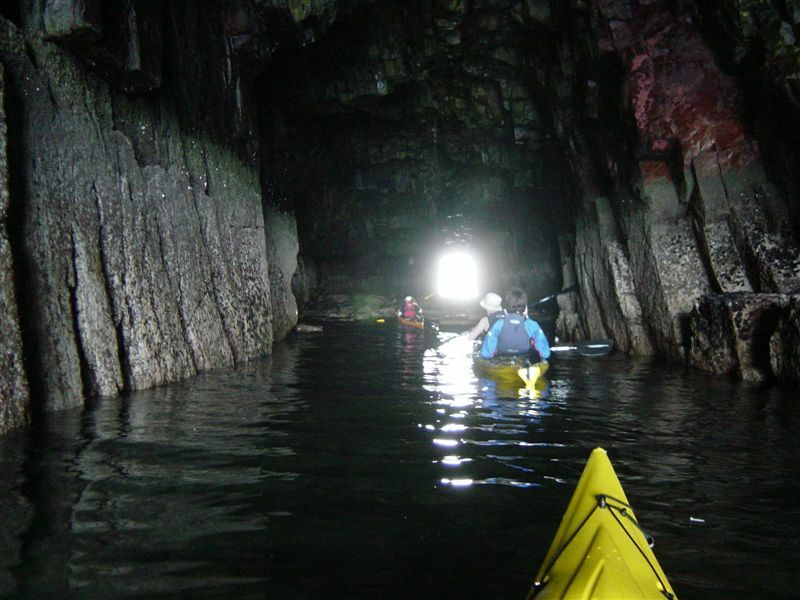 On the way back we saw a seal in one of the other arches and as we paddled back along the coastline we saw more cormorants perched in rows along a series of rocks and apparently observing a strict pecking order with the largest birds occupying the best vantage points. Once we rounded Blackhead the swell was behind us and we were able to catch a ride from the waves until we got further into Dooneen Bay where the water was more sheltered. We stopped to chat to a family fishing from a small boat who donated some mackerel for Noelle�s supper. 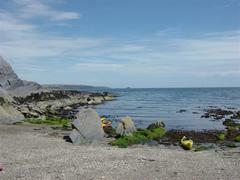 Finally, we arrived at the Quay in Dooneen delighted with our first day�s sea kayaking. Total distance paddled was about 12 kilometres. More photos of the trip are available here.